Ingredients: If you liked the plot of Alien, the frightening environment of Sphere, and the special effects of The Thing (2011), then you will like this movie. So first thing’s first, Prometheus is most definitely a prequel to Ridley Scott's original Alien movie. Set 70 years in the future, two archeologist unearth directions to a far off galaxy that may hold the secret to humanity’s origins. Funded by global conglomerate, Weyland Industries, the two are given a ship and crew to travel to the solar system in hopes of finding mankind’s creators. But everything is not as it appears and what was an expedition of discovery becomes a nightmarish battle for survival. The film has fairly all star cast. Noomi Rapace plays Elizabeth Shaw, true believer and one of the original founders of the theory. Logan Marshall-Green plays Charlie Holloway, Elizabeth’s boyfriend and fellow archeologist. Guy Pearce plays the eccentric Peter Weyland. Charlize Theron plays Meredith Vickers, the hardass no-nonsense business representative. Michael Fassbender does a terrific job playing David, the ship’s android. And I actually found myself liking Idris Elba playing Janek, the ship’s pilot. 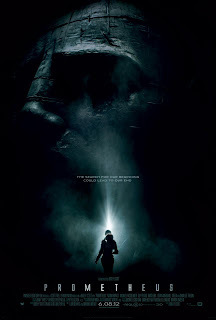 I had high expectations for Prometheus. Maybe too high in retrospect. The beginning of Prometheus was fantastic. Outstanding visuals and very engaging possibilities. The first hour or so was already very reminiscent of the previous Alien installments. And with the introduction of the android David, I thought the movie would have some great character moments. But it turns out David was one of the few with a developed character. His numerous quirks and subtleties made every scene he was in very enjoyable. And he turns out to be a very complex character. The same goes for the ship’s pilot, Janek. It’s just too bad no one else had any worthwhile personality. The two archeologist who had the half-baked idea that human life was started by an extraterrestrial intelligence find out that they are right, which you would assume would make them excited but you could hardly tell by how they acted. Maybe if the crew of the Prometheus were enthusiastic about something it would have had more an impact when bad things started happening to them. But as it stands, you’re just watching somber people get picked off one by one with no visible concern for each other. It's hard to determine what tone Prometheus was going for. The scenes were dark and grim but then the musical score was triumphant and hopeful. It’s like watching Jaws with the Star Trek theme playing. The film feels like a cluster of incomplete ideas. Unanswered questions and undeveloped characters committing irrational acts. At one point, some horrible creatures are introduced then never brought up again. There’s so much in Prometheus that is hard to understand, not because the plot flew by too quickly but because of the numerous contradictions. And there’s weird exposition as well. A few times someone says something for the sole purpose of set up for whatever is going to happen to them later. So much of what made Ridley Scott’s original Alien so memorable was the simplicity: the crew of a spaceship land on an alien planet. One of the crew members is infected by an alien creature. The creature starts killing off the crew. Simple and straight forward but executed perfectly. With Prometheus, Ridley Scott feels like he’s trying to recapture the same spark but is bogged down with too much narrative. I was so busy trying to figure out the point they were trying to make that I couldn’t completely enjoy what I was seeing. What made Alien so scary was the slow build up, setting the mood for the movie. Then all at once putting the pressure on and keeping your heart racing until the very end. But with Prometheus, there’s too many start and stops. The slow build reaches boiling point but it only spills over into the cringe inducing spectacle a handful of times. Really, everything else is just exposition or set up. The events in Prometheus are unfortunately either not explained enough to be a science fiction thriller or explained too much to be a space horror flick. The movie had the chance to really expand on the history and mechanics of the xenomorph universe but the vagueness of the plot stops it from completing its goal. In the end, Prometheus was just an unnecessary story and a lack of explanation would have been preferred over this convoluted one. I think you discount Shaw. She embodies Darwin! How could you not admire a woman that BA? The badassness of Shaw was never in question. Yes she does some pretty awesome stuff. But this does not make the movie any less convoluted or vague.